Right wing commentators and newspapers have taken to using dirty tactics to challenge the seemingly endless rise of Scottish National Party leader Nicola Sturgeon. The title of “most dangerous man in Britain” was once given to the late left-wing stalwart Tony Benn, who died last year. The Mail also headlined a story concerning the politician “Little Miss McHypocrite,” while the Murdoch-owned Sun took off the Miley Cyrus song ‘Wrecking Ball’ to depict Sturgeon riding said demolition tool while clad in skimpy tartan. Her detractors have also taken to comments which contain more than a hint of sexism. “Nicola Sturgeon may wear high heels and a short skirt, but she eats her partners alive,” said Sun columnist Trevor Kavanagh on Monday. 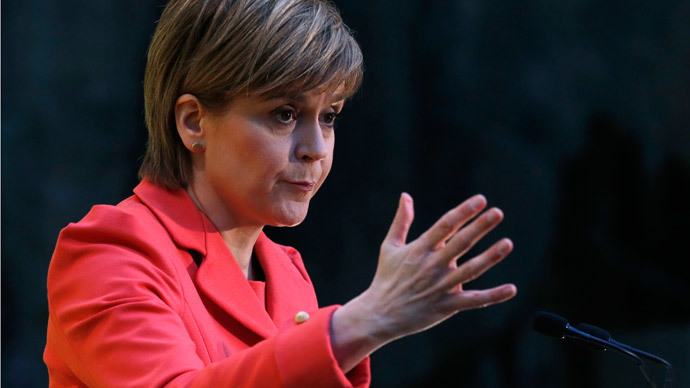 There are a number of reasons Sturgeon is drawing fire from the establishment. Last month she hinted she would seek another independence referendum after 2016 that could see Scotland separate from the United Kingdom. Scotland narrowly voted by 55 percent to 45 percent to stay part of the UK in last September’s referendum after Westminster party leaders “vowed” to give the Scottish Parliament more devolved powers. Amid some backsliding on those pledges by Westminster politicians, however, SNP support has since surged, with the latest polls predicting the party will win at least 43 of the 59 Scottish seats in the UK parliament, effectively wiping out Labour’s traditional Scottish strongholds. The SNP is thus set to become kingmaker in the event of a hung Parliament, when no party gains an outright majority of seats.